Discussion in 'Traditional Folders and Fixed Blades' started by Campbellclanman, Jul 17, 2011. Well, as we have noticed John Lloyd's name is popping up in the forum here and there. 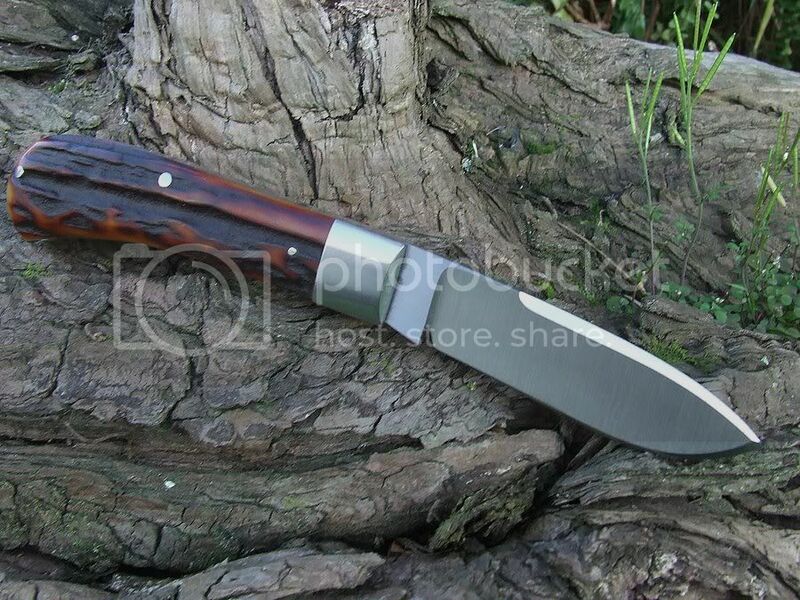 I have just had the arrival of two of his knives, I already have posted a couple of photos of two of this same maker in my other thread, and the gunstock knife with the fish shield has had quite a few very favourable comments, and rightly so, as that knife is a lovely, well made knife...here are my two latest from John Lloyd. Please forgive the first 2 photos-quite blurry, my light was running out very fast, and the snaps were taken in haste, but hopefully you can look past this and see the knife ok. This slimline has great walk and talk, nice smooth action, easy pull to open, would be a 3/10, absolutely fantastic Stag. Fit and finish is just superb. 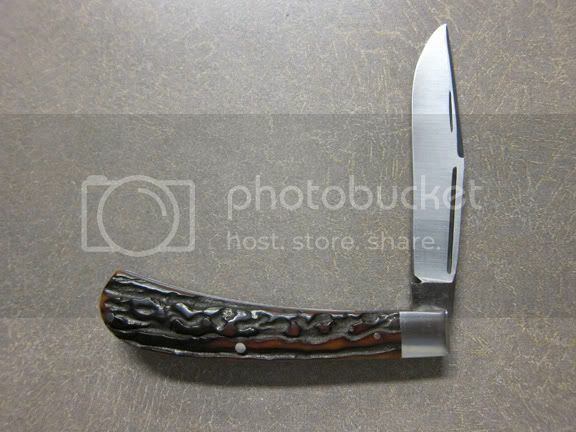 If you wanted to fault this knife, there is a slight gap in the spring, and one side of the blade( the face) there is a imperfection or better described as a wave in the face -again only slight-you may have seen this in the 70's Solingen fixed blades a lot-as this was most common with them. The fit of the blade to the spring is near perfect when open, great snap in all areas, spring is nice and flush when at half stop ( now Im not too sure if this is a sign of quality here-but on my production knives-most have the spring exposed when at half stop ). I notice that John has different Tang stamps as well, it would be interesting to find out just why this is? In one of the photos you can see a few scratches-the light makes these stand out terribly and are only very very slight, this is not caused by any blade rub. The faults I have stated dont mean anything at all to me, as I look at what I paid for the knife, and balance that out to the knife itself...the knife is in my eyes just a beaut, and this stays with me ..here it is. 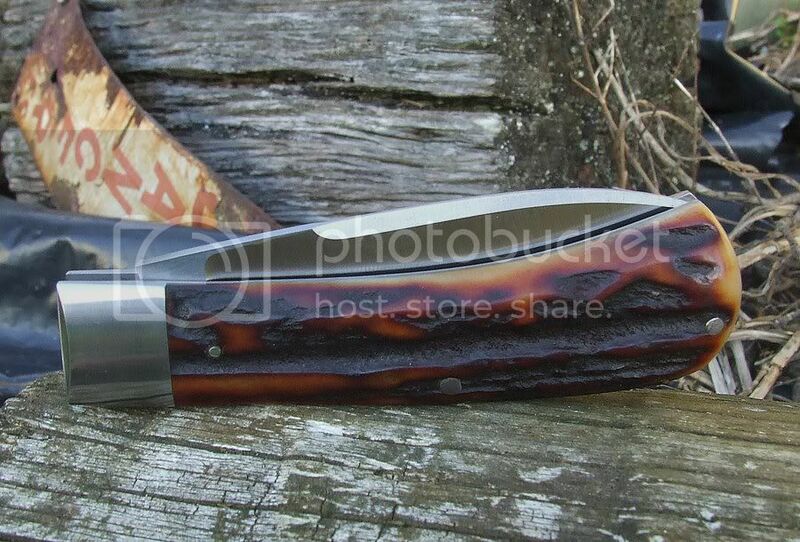 Man...this knife is a honey, again...stunning Stag, once again with John his fit and finish is superb...it really is. The blade - as with the slimline Trapper is 52100, please...could I have your opinions of this steel, I have a jack that is one of Johns, made from the same steel, and I found it quite easy to get a very sharp edge. Pull on the knife would be a 4/10...perfect for me, extremely strong snap in all areas, the blade is hollow ground-like the older cut-throats ... this knife is simply beautifull, and again for the price I paid...the quality is far superior as to what I was expecting. Thank you folks for having a look, I hope it was worth your time in doing so. Getting older and Fodderwing like this. Sweet Duncan! I especially like the 2nd. Those swedges! GOod lord! Hello All: I do appreciate the reviews and must comment a bit. I learned to make slipjoints on my own and still have never seen one built. I have made between 4-500 slipjoints and these two were some of my beginnings. I sold them at Blade knowing that they were not perfect....but what do I do..take them to the dump? In fact I sold about 160 knives at Blade...all probably imperfect...but good user knives. I have come a long way since these knives and make good ones now...I think. My fit and finish was not up to par and you see it here. I have a small home in Mexico and have made many knives there and sell or give them to the fishermen, ranchers, and carpenters. I enjoy it immensely. They do not care one iota about fit and finish...they want a knife that performs and is easily sharpened. Now, I do realize the American market is completely different. I am changing my evil ways! Habits though are hard to change. 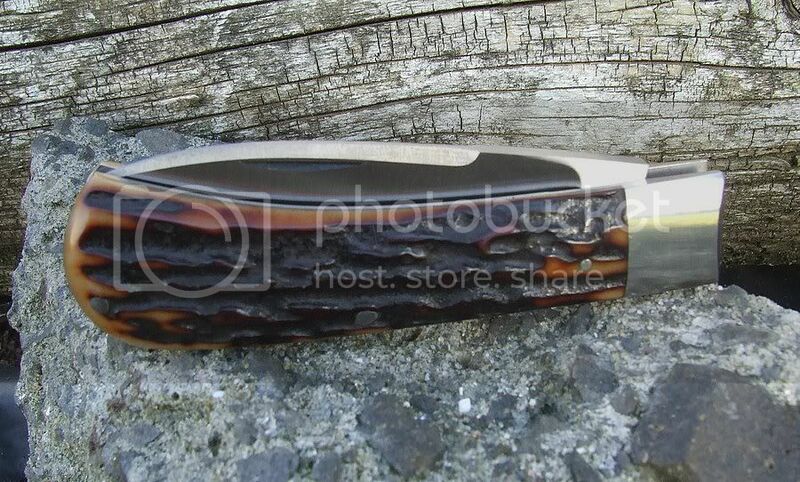 People like Don Hanson, Brent Cramer, Blues, Ken Erickson have helped immensely in my slipjoint building. Don Hanson once asked me how long it took me to build a knife. I replied that I built about two a day if working 8 hrs. He told me to slow down, take more time in fit and finish, and well...just do a better job. I did do that. Now...I build one before 11AM, then go fishin! No...really..I have slowed down and knives are much better. I was lucky to meet a few dealers at Blade and they ordered quite a few. I have made about 30 knives since Blade and they are all better than any before. Am still trying to figure out camera work and to be able to post on the forums here........but...like my knife building...I am a slow learner! As far as different stamps.....I use the J H Lloyd Loreto stamp while at my home in Loreto, Baja Sur, Mexico. It is a small fishing village on the Sea of Cortez. I do have a few other stamps but have gone to a script version of Lloyd when in St. Louis, Missouri...home. Again thanks very much for all of the people here at the blade forums as this is where I learned how to build a knife. I was using my own Lloyd knife the other day to cut numerous vines on a trail through the woods that I take with my dog on many mornings. That 52100 just sliced through the encumbrances allowing a more pleasant and less tangled path. I'll be looking forward to seeing (and owning) more of John's knives in the future. Enjoy them Duncan. In a way,you owning those knives,makes me think of it,as if you were there in Atlanta & met John yourself.A heckuva good fella & like Elliott says,it'll be great to see more in the future. Always glad to help. 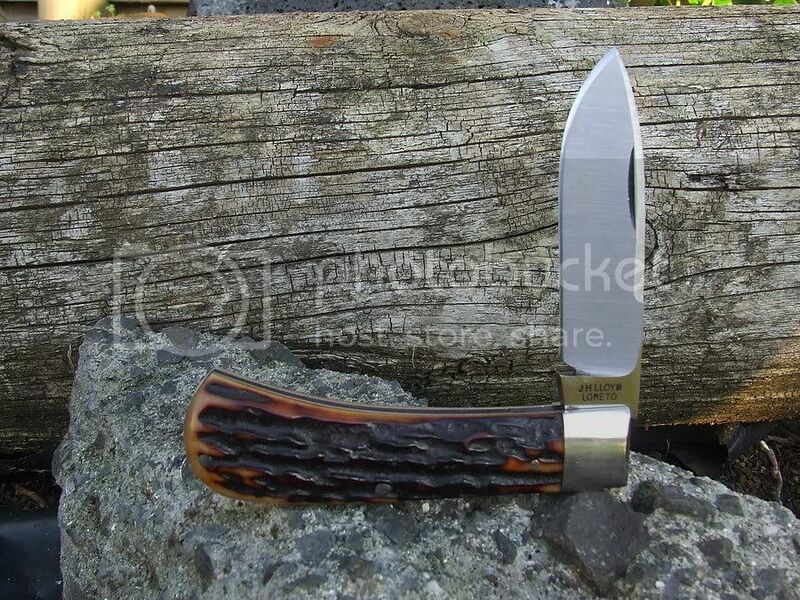 I like John's can-do attitude (not to mention envying his situation of building knives by the sun and sea), that's why I have one on order from him. I picked one up from Vince a few weeks back, John makes great knives. I have one enroute now from John..can't wait. I love that second knife. I am pretty darn sure this wont be my last knife from John ! Thanks again to all of you. It makes me want to go back out to the shop and work a bit. Thank you. What are the lengths of those two knives? Thank you everyone for the comments, and John..what a pleasure to have you come in and educate us a wee bit of your work-thank you so much for that. I hope that you haven't taken anything I said as a slur against your work - this is why I was careful to state earlier work, and I agree with what you say, I'm thinking we all would scream if we were to hear that you dumped your early work just because they were just that-your early work. I think your knives Sir are just fantastic, if you are making better knives now-then I would love to see them, because my ones I have here are just brilliant. I envy John greatly with his talent. Vince, as always was straight up and explained a lot to me when I bought them, and I got a well described knife in each case. So...John, thank you for your lovely work, and welcome. Cambellclanman: No slur taken. The old man used to cuss me out for a unfinished job when I was a kid. No different now 50 yrs later. It helps immensely to have someone critique ones' work. How do you know if you are ever getting better. That's what I meant about knives in Mexico....they don't care about fit and finish as long as it cuts and you can sharpen it. Lil different up north! Thanks again. I have got one LLoyd folding knife, then 2 , then 3, then ? ummm, is there any cure ? I meet John at the blade show this year. I think he will be a major player in the slip-joint game very shortly!! That coming from you is a tremendous compliment to John, this is why I put up this thread, I just wanted people to see Johns knives, and to help spread the word on his great knives, unbeknown to me...people like your self have already met John and this tells me he is definitely on the way...its great to hear. to get them interested in slipjoints. I saw him giving knifes to young people to get them interested in slipjoints. I am one of the 'kids' John gave a knife to. :thumbup: The only Lloyd I came home with. But, I handled the majority of John's folders and you can call me impressed. Plus, where do you find that many carbon steel slipjoints in one location? I am a carbon steel fan. John is a pleasure to know and listening to critiques of his past work is only going to put him up there with the best. I keep my Lloyd slipjoint next to the computer at all times, 1) because I really like its looks, 2) because I open and close it daily, just because it does so just exactly right for me, and 3) it has become my desk/mail knife. I would carry it some, but would only get to admire it when I used it. I appreciate your reviews Duncan. Hearing that John is slowing it down for some better fit and finish is music to my ears, and should be for all of us.